Highway 83 offers no shoulders and is a dangerous ride. This cyclist will force motorists around him towards incoming cars. 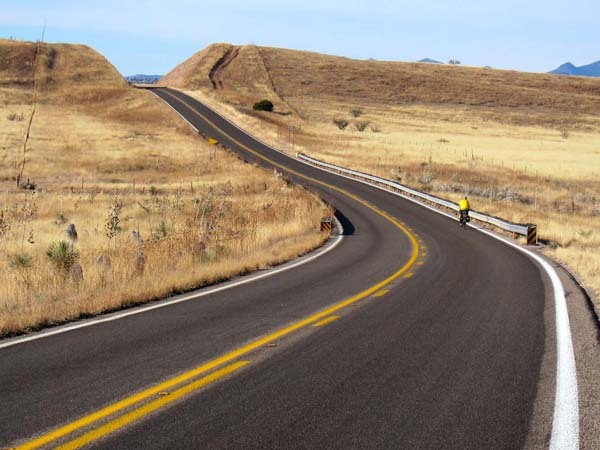 ROAD CYCLING, TUCSON, Arizona –Road biking Highway 83 to Sonoita, Arizona is one of the most dangerous and ill-advised cycling routes we can name. There are no shoulders on this road and motorists travel at high speeds. Motorists are greeted with frequent blinds spots on this very narrow highway. Sadly, there are many cycling organizations who run bike tours from Tucson to Tombstone and Bisbee who use this road. This is a dreadful mistake that has lead to cyclists being killed and injured. Most of these cycling tours are run by out of state organizations, lead by people who do not live here. Cyclists ride this highway to the chagrin and dismay of local law enforcement. Cyclists often find themselves victims of tremendous road rage. Check out our YouTube road trip video to the top right. Even better, check out this video here from some of our Tucson motorcycle friends. Check it out at 2.5 and 6.5 minutes into the video and just get a look. This highway is one of the the most beautiful highways in Arizona. It’s a shame they did not provide shoulders or have road biking in mind. If this highway had shoulders, this would be one of the best road bike rides in Arizona. Tucson to Bisbee rides are not very popular as much of the route is on highways that offer no shoulders or highly uncomfortable riding.